There are four types of rooms in Can Travé, all of them built in a traditional country style: three double rooms and a single one. Among the double rooms there is a suite which includes a bathroom and a fireplace. The furniture perfectly suits the atmosphere of these rooms: a rural, austere style dominated by the strong character of the stone walls and the ceiling covered by wooden beams. Can Travé also offers its guests a big lounge/dining-room, fully equipped in order to fulfil their needs concerning leisure and amusement: TV, fireplace, a table for eating, natural light from the outside, a couch, etc. The light of the house is also austere and its warm reddish tones inspire well-being and comfort to our customers. Besides, Can Travé has a kitchen which remains at the entire disposal of our guests and includes all the necessary equipment to get the most sophisticated dishes with no need to leave the house. Indeed, the kitchen of Can Travé has an oven, vitroceramics, a fridge and, obviously, all the cooking tools which might be needed. Finally, one of the great advantages of this house lays on its large terrace, most appropriate to enjoy a delicious, fresh summer night, as well as for sunbathing. This terrace is equiped with a big table and chairs, where our guests will be able to taste the most refreshing meals of this summer, as well as a barbecue and a grapevine, from which our clients can pick grapefruit whenever they wish so. Six of us (all adults) stayed in Can Trave in the first two weeks of September 2010. 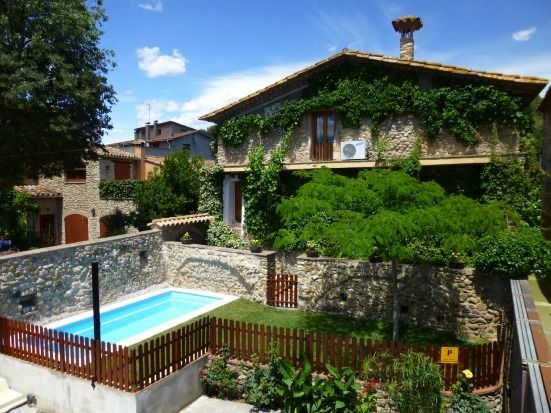 It's a large, old, stone built house in the middle of Crespia, a small village 35 minutes drive from Girona airport. The house is very well equipped and there is plenty of space on three floors. There is a little shop in the village which opens in the morning and from late afternoon until 9 in the evening. We did our shopping there, collecting our bread every morning, and also in Banyoles which is the nearest town about 20 mins away. Banyoles is situated on the edge of a lake and has supermarkets, cafes and restaurants and an interesting old centre with a lovely Placa Major. As well as Girona, in easy reach is the coast, Figueres, Besalu, the Garrotxa natural park. Barcelona is 2 hour's drive. Carlos and his wife were there to meet us when we arrived the first evening and were very helpful and welcoming. Carlos speaks English and gave us a lot of information about the area. The weather was perfect, sunny and warm, and we had a very good holiday. Una masía rústica toda de piedra muy chula, grande y muy bien equipada. Fuimos 8 amigos de Francia a pasar una semana en Can Trave y vivimos una experiencia fantástica ! Carlos y su madre nos acogieron y nos trataron fenomenal durante toda la estancia. La casa está súper limpia y muy bien equipada. Las habitaciones súper cómodas. La piscina súper limpia y el jardín increíble. Pudimos disfrutar de la tranquilidad de la casa y del entorno. Lo pasamos fenomenal, muy recomendable sin ninguna duda, volveremos ! Millones de gracias y hasta pronto ! Merci beaucoup et à bientôt ! Queríamos dejar nuestra opinión en la página ya que fué una experiéncia genial. El trato con los propietarios de 10 desde el primer momento, muy atentos. Nuestra experiencia fué en familia, con niños y mascotas. Es un pueblecito muy familiar y acogedor y tienes unos alrededores fabulosos. La casa está perfectamente equipada. Fuimos seis amigas y una mascota, un perro. Realmente si quieres descansar y desconectar este es el sitio ideal. Ni un solo ruido, duermes plàcidamente ya que los colchones son fantàsticos. Sin necesidad de coger el coche puedes pasear por muchos senderos cercanos. Lástima que, aunque el tiempo fue bueno, todavia no era epoca para darse un baño en la piscina, pero si que pudimos tomar el sol, mientras preparabamos la barbacoa para comer. En fin si tenemos ocasión volveremos. Ah! y Roc, nuestra mascota, se lo pasó genial. Tenemos que fecilitar a los dueños. Tienen una casa muy bien equipada y muy limpia. El trato inmejorable. Nosotros estrenamos los colchones viscoelasticos nuevos que han puesto. Se duerme increiblemente bien. saludos y volveremos.